Get access to members-only content on this site that includes forums, crime and safety information, lists of service providers, neighborhood directory, special invitations and more. Your $35 annual dues supports this website, a biannual newsletter,community clean ups, the Holiday Party, government lobbying for resources and special community issues meetings that can include government representatives. There is strength in numbers! Residents within, and owners of property within, the Missionary Ridge Neighborhood boundaries. Please allow us a few weeks for postal delivery, check deposit, amount posting and entry of your information into the website. Or - and it's much faster and simpler - join here online. You could be a member of our site in a few days. JOIN ONLINE HERE - 4 Simple Steps! 1. ENTER your info/interests beginning with the below. 2. CONFIRM the info is correct. Be sure your email address is right! PayPal is just the service we use to validate credit cards for us. You may prefer to pay with Visa, Mastercard, Amex or Discover. You do NOT need a PayPal account, UNLESS you want to enable recurring annual payments (option (a) above). 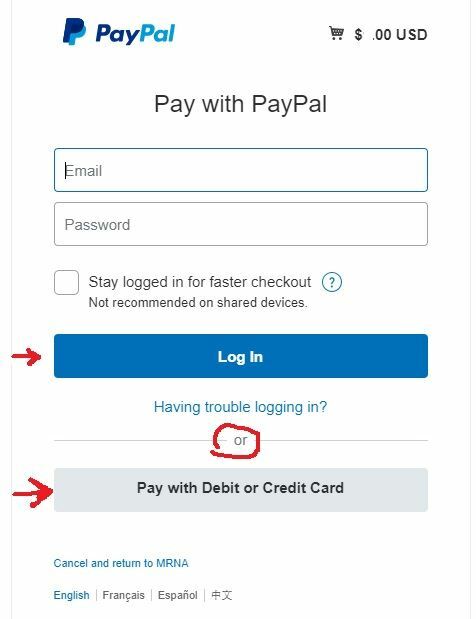 When paying online you will be taken to a PayPal screen that gives you the option to use EITHER your PayPal account OR a major credit card. That screen looks like the below. 4. WAIT a few days for us to verify your address as being within our neighborhood boundaries. You will get an email from this site with the word "ACTIVATED" in the subject title when you have been confirmed for membership and granted members-only access to our site. NOTE: We do not receive or store any credit card data. In order to avoid multiple annual billings, only one membership/emailaddress per household is supported at this time. You may want to use a household picture for your profile. Annually Expiring MRNA Membership - NOT AUTOMATICALLY RENEWED - $35.00 (USD) Subscription period: 1 year No automatically recurring payments YOU DO NOT NEED A PAYPAL ACCOUNT FOR THIS OPTION, but you do need to use a credit card. No credit card data is kept or used on this site. Our site uses PayPal to validate the card. Annually Recurring MRNA Membership - $35.00 (USD) Subscription period: 1 year Automatic renewal (recurring payments) This is like a magazine subscription and will automatically renew your MRNA membership every year. PLEASE NOTE THAT THIS OPTION REQUIRES THAT YOU HAVE A PAYPAL ACCOUNT.